The science staff is busy writing their methods; techs are busy prepping, stocking and training scientists on the equipment. 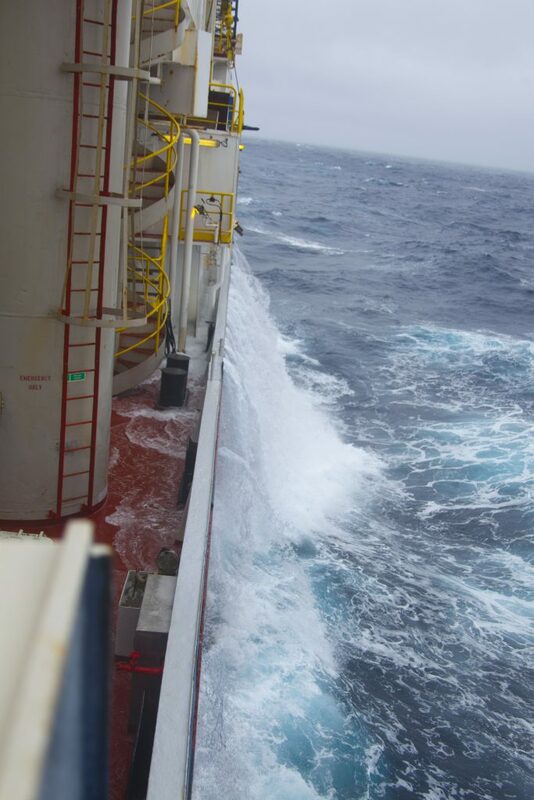 Crew members are busy with their respective tasks, while the decks remained clear today from the constant onslaught of waves. We found ourselves buffeted quite frequently to our port and starboard sides. Business at the ship’s hospital had been quite brisk for those seeking motion sickness pills. All while JR rocked back and forth, still plodding along as we gain speed and gained miles towards our destination. Despite the weather everyone will be ready when we get to the site. Though there is still the need for final preparations once we are at the site, surveys to conduct with the VIT camera, set sonar beacons on the seafloor, make up drill pipe. The labs will be waiting on cores, but not quite as much as the scientists will be. As a gentle rocking from is all that remains of our choppy water from this morning and it now lulls some of us towards sleep. So I leave you tonight with the notion that many are feeling the same- hopeful for what the next few days will bring and eagerly awaiting the outcome.